to make a statement. He has got some appointment. celebration of birth centenary of Netaji Subhas Chandra Bose. of Netaji in a befitting manner. had entrusted to it the task of preparing an action plan for the celebrations. inaugural function on 23rd January, 1997 as well as during the centenary year. centenary year in the light of the suggestions received. 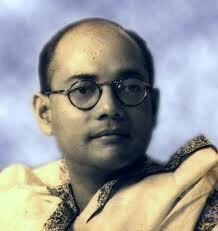 great and momentous contribution made by Netaji to our freedom struggle. parts and the celebration would be designed to reflect this in full measure. birth day of Netaji is commemorated by posterity in a befitting manner. on Netaji will also be released in that function. for bringing out the Collected Works of Netaji Subhash Chandra Bose. Red Fort - Salimgarh Fort Complex will be strengthened. integrate them in an enriching manner. birth centenary in a befitting manner. SHRI DEVE GOWDA: 23rd January is declared as a National Holiday for 1997 only. it is welcome. You can give more suggestions. bad shape. (Interruptions) The Prime Minister should take note of it. whatever documents are available with the Defence Ministry regarding the INA. MR. SPEAKER: No. I do not think that we can finish our business like this. MR. SPEAKER: Shri Nitish Bharadwaj.